So, you’re expecting a baby. There’s a lot to plan for, right? You need to set up the nursery and find the right baby monitoring system. Possibly, one of the most important decisions you’ll make will involve finding the best travel system: you can't really do without such a car-seat-and-stroller combination. Which brand is the best? What is the best model among the hundreds out there? In this review, we look at a wide variety of the best baby transport systems on the market to help you make the best decision for your growing family. The last thing you want to worry about when expecting your child is making a mistake when choosing the best travel system to use for your baby. When it comes to the best travel system, there can’t be any second-guessing. The brand you choose needs to be one that you’re confident in, know is safe. It also must be one you can afford comfortably. Let’s look at some of the best-known travel systems and some with brand names that may be new to you. Generally speaking, a baby travel system consists of a full-sized stroller and a compatible car seat. The car seat should be adaptable with the stroller and also your vehicle. You can clip the seating component onto the stroller when traveling on foot and then remove it and use it as a car seat when traveling in your vehicle. What Should the Best Travel System Do? With a travel system, you always have a car seat in place when you’re traveling by vehicle with your baby. Then, when you go walking or jogging, that same seat can be secured to the stroller for easy access and safety. You won't need to remove your baby from seat to stroller or vice versa. It’s best to look for the car seat first. While the stroller is always going to be important, the car seat is an absolute requirement to keep your baby safe while in the car. You’ll want to find one that fits tightly and is easy to move in and out. Always ensure you comply with federal and state rules and laws when it comes to your car seat. A quick note: While U.S. federal rules outline definitions and guidelines for car seats, each state has its own laws concerning car seats. The American Automobile Association provides a useful breakdown of each state’s laws regarding the use of car seats. We reviewed the following products based on the following parameters: Features, Pros & Cons, Price, Where to Buy, and Warranty. We looked at top sellers, including a cross-section of brands and price ranges. We examined customer comments and reviews posted on various retailer websites. We then compiled all this information to present a look at a variety of systems for parents and their children. What makes a stroller/car seat combo the best travel system? Looking at a variety of systems, we determined that overall quality drives what makes a combo the best travel system. A model by Uppa Vista was the most expensive one we looked at, retailing around $900. It offers enough space for additional children to ride in the stroller. While it stood out for its quality and design, lesser-priced systems also offered quality alternatives. We believe this review offers a fair look at this broad range of products. Key features of this product include its three-wheeled, lightweight frame with easy access to the car seat. At 22 lbs., the stroller is easy to fold and load and unload in your vehicle. Able to hold a child up to 50 lbs., this Graco Fastactionunit is one of the best travel systems out there because of its size and maneuverability. This product can be found on Amazon for around $235 to $260. Graco provides a limited warranty for this travel system. For specific coverage questions in the U.S. and Canada, you can contact customer service. Key features of this product include the ability to use one hand to fold the lightweight Baby Jogger system. What makes this one of the best travel systems is that the car seat is easily transferred either way with minimal effort. The umbrella hood provides sun and weather protection for your baby and the unit's three-wheeled construction allows the stroller to be used over all types of terrain. This product can be found on Amazon in the range of $480 to $520. This high-end travel system comes with a limited manufacturer's warranty and additional protection plans can often be purchased. FLEXIBLE INFANT TRAVEL SYSTEM: The Evenflo Pivot Modular Travel System is a car seat and stroller combo featuring the Sarema Infant Car Seat and Safe Zone Base, infused with parent- and child-friendly accessories. VERSATILE & LIGHTWEIGHT: The Evenflo 3-piece stroller set features a modular frame with 6 modes. The reversible mode permits your baby to face in or out, while the seat converts to carriage, frame stroller, or travel system mode with ease. 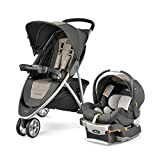 EASY INFANT CAR SEAT TRANSFER: This car seat and stroller combo has been designed with a stay-in-car base that allows for a quick and safe infant car seat connection from stroller to car and vice-versa. MULTIPLE HANDY FEATURES: The Evenflo Pivot Modular Travel System also includes an oversized storage basket, a safe-zone base, and a blanket boot. A large canopy and removable arm bar make baby transfer easier and improve comfort. TRUSTED FOR NEARLY 100 YEARS: Evenflo has been a trusted source of quality-built child-safety systems for almost 100 years. The real-life design that goes into each of our products has been engineered for everyday use. Key features of this system include a car seat that is lightweight and easily shifted from car to stroller. In addition, this product makes our list of the best travel systems due to its storage space and cup holder. We liked that the canopy folds down, providing complete shelter for the baby. The stroller can be folded and stored easily in your vehicle. This product can be found on Amazon for around $270 to $300. This travel system has a limited warranty and additional coverage may be available for purchase at or after the point of sale. Key features of this product include the easy transfer it provides from car to stroller and vice versa. A removable and adjustable cover makes this Chicco Bravo package one of the best travel systems. The stroller is well built, including all-wheel suspension. The four wheels are foam-filled for a smooth push and ride. The stroller is narrow in profile, which allows easy maneuverability. Rated to hold a child up to 50 lbs., the versatile stroller uses quickly interchangeable baby and toddler seats. This product can be found on Amazon for around $370 to $400. This travel system comes with a limited warranty. For more details, you can contact the manufacturer. Key features of this product include space for two or three children, making the Vista the best travel system for large, quickly growing families and those with multiples. Offering flexibility and maneuverability, its basket space can store up to 30 lbs. Its size allows us to use it throughout a baby’s early growth, eliminating the need to buy a new travel system too soon. This product can be found on Amazon for around $880 to $920. This travel system comes with a limited warranty. 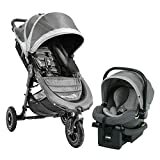 Key features of this product include a car seat combination that makes the Britax B-Free & B-Safe a high-ranking entry in our search for the best travel system. 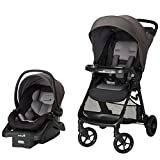 Featuring three-wheel, lightweight construction that allows easy maneuverability for the stroller, it also has an easy-to-use car seat for both your car and the stroller. While the stroller can hold up to 50 lbs., the Britax is recommended for children up to 35 lbs., with the rest balanced in its storage area. A limited warranty is provided with this travel system. Key features of this product include a well-constructed car seat with a steel frame and impact-absorbing base, as well as side-impact protection. In addition, what makes the Pathway a candidate for the best travel system is the lightweight frame on the stroller, including four wheels that allow easy maneuverability. The canopy provides excellent protection against the elements. The seat can recline partially or even fully, allowing your baby a better nap and adding to this system's claim to the title of best travel system. Its 28-lb. frame allows easy folding and storage. This system can support a child up to 55 lbs. As we write, this product can be found on Amazon for around $380 to $400. Clearly one of the best travel systems in quality and value, this Pathway system from Britax is backed by a limited warranty. Key features of this product include added neck and back support on the car seat. What makes the Smooth Ride a best travel system is its all-in-one configuration, allowing easy transition from the car to the stroller. 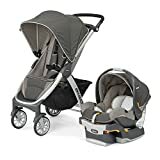 The lightweight stroller features an oversized canopy with a visor and peek-and-boo window, providing shade and allowing air to flow easily to your baby. 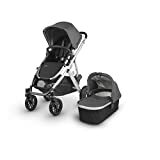 Designed for babies up to 35 lbs., another factor that helps make this one of the best travel systems is the four-wheel base, which allows for easy maneuverability. Weighing 32 lbs., the stroller is easy to fold for storage in your vehicle. This product can be found on Amazon for around $170 to $200. Key features of this product include the dual-wheeled three-point stroller, which allows for easier steering and better maneuverability. That is one big reason why the Viaro is one of the best travel systems we could find. Featuring solid front-end suspension, the stroller in this package can handle rough terrain with ease, another mark in its favor. The child tray has two cup holders, while the adults get one. Along with its nicely padded handle, the stroller also offers storage space in both front and back. This product can be found on Amazon for around $340 to $360. Includes Graco's SnugRide SnugLock 30 Infant Car Seat, for rear-facing infants from 4-35 lbs. and up to 32"
Key features of this product include reversible car and toddler seats that allow you to maintain eye contact with your child. The car seat can be attached to the stroller or you can use the toddler seat already positioned there. 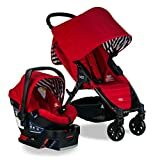 Another feature that makes the Modes 3 one of the best travel systems is the stroller’s construction, which features air-filled tires, a suspension system, and reflectors ideal for safer jogging. This product can be found on Amazon for around $235 to $250. This system comes with a limited warranty. In visiting with parents, we found that the Graco models often rate as the best travel systems in their eyes. 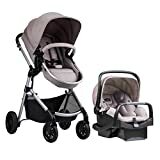 They like the ease of connecting the car seat to the stroller and the equal ease of transitioning back to the car. They feel these strollers are lightweight and easy to maneuver. While each had their favorite Graco system, the best travel systems reviewed here are worthy purchases: the Graco Fastaction Fold Sport Click Connect and Graco Modes 3 Lite.